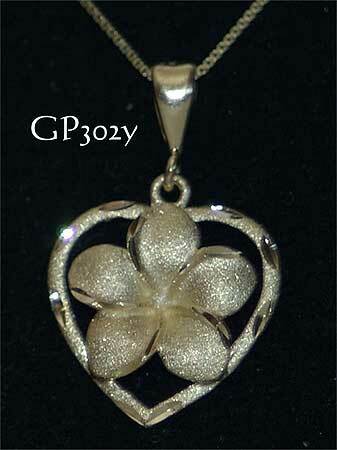 Solid 14 carat yellow gold Hawaiian Plumeria (frangipani) heart pendant. Sparkle frosted with diamond cuts to the surround and petal edges. A stylish piece of Hawaiian jewelry. Measurements: Flower is 13mm diameter; heart is 18mm drop, 16mm wide.